We’d love your help. Let us know what’s wrong with this preview of Off Grid and Free by Ron Melchiore. Off Grid and Free: My Path to the Wilderness is the story of the journey Ron Melchiore undertook as a young man from the city, first to homesteading in northern Maine and then to living in the bush of northern Saskatchewan. He has lived off grid since approximately 1980 and speaks candidly about the joys and the tribulations of his chosen lifestyle. 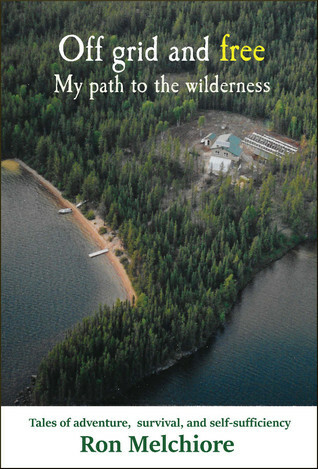 In this nonfiction, Ron Off Grid and Free: My Path to the Wilderness is the story of the journey Ron Melchiore undertook as a young man from the city, first to homesteading in northern Maine and then to living in the bush of northern Saskatchewan. He has lived off grid since approximately 1980 and speaks candidly about the joys and the tribulations of his chosen lifestyle. In this nonfiction, Ron shares the diversity of his experiences in an easy-to-read, humorous, and sometimes harrowing narrative. The book includes his hiking of the 2,100 mile Appalachian Trail in winter, bicycling across the United States, homesteading off grid, and the terror of being surrounded by a wildfire and surprise encounters with bears, and more. For readers with an outdoors spirit, people with an off grid and self-sufficiency bent, and dreamers who like to read about adventure, Ron hopes to inspire others to "take the road less traveled." To ask other readers questions about Off Grid and Free, please sign up. As a half a century long off grid person I can say Ron and his wife understand how to be successful. This is not a step by step how too book, but a book on the general mindset it takes to make it long term. These are the key points you will find in this book if your dream is to build a long term homestead. -Have to love outdoor work. -Have a spouse that is your partner and friend. -Do not shun technology to make your life easier. -Do not go into it believing you can live Ron gets it! -Do not go into it believing you can live like a 17th century peasant. -Enjoy learning about every subject that pertains too your survival. -Avoid debt and pay it off early if you do. -Try and start with a nest egg. -You will always need some income. And number one you have to love freedom more than relying on others to provide your security. I enjoyed this book. It was the memoirs of a man and his wife that live in Northern Saskatchewan, off-grid and very alone. You may think it sounds dry and boring, but I thought it was very open and readable, not dry at all. In fact, I thought it was quite gripping, but then again, I find an off-grid lifestyle rather interesting. If that sort of lifestyle attracts you, even just reading about it but not wanting to do it yourself, grab a copy of this book. It's almost as good as going off-grid your I enjoyed this book. It was the memoirs of a man and his wife that live in Northern Saskatchewan, off-grid and very alone. You may think it sounds dry and boring, but I thought it was very open and readable, not dry at all. In fact, I thought it was quite gripping, but then again, I find an off-grid lifestyle rather interesting. Excellent read. The chronicles of Ron and Johanna were intriguing. This book will ALWAYS be within reach and help keep me in check. It's so easy as to be a city dwelling, money chasing, rat race living individual. The road less traveled seems so far off. The stories encapsulated in this book will hopefully inspire us all to do something different. Ron details his Appalachian Trail hike, bicycle ride from Washington to Maine, logging adventures, and tremendous move to Hockley Lake. Excellent book, very enjoyable, can set recommend for anyone interested in going off grid. Very envious of his lifestyle! Thanks Ron! Be very impressed with this book, I recommend it.